Celebrating almost 50 years of hosting sports car and open wheel event, the Mid-Ohio Sports Car Course is the location of the 2011 IZOD INDYCAR Series season's 11th event. Born in Columbus, Ohio home, Service Central Chip Ganassi Racing driver Graham Rahal must have felt some hometown magic lapping the Lexington-based race track during Friday's practice. The #38 car of 22-year old Rahal lapped the 13-turn, 2.258 mile track in 1 minute, 9.6031 seconds in one of his 20 laps in the session. "It feels good to start the weekend off this way for sure. I think we showed the grip is low, but at the end of the day it felt pretty good." 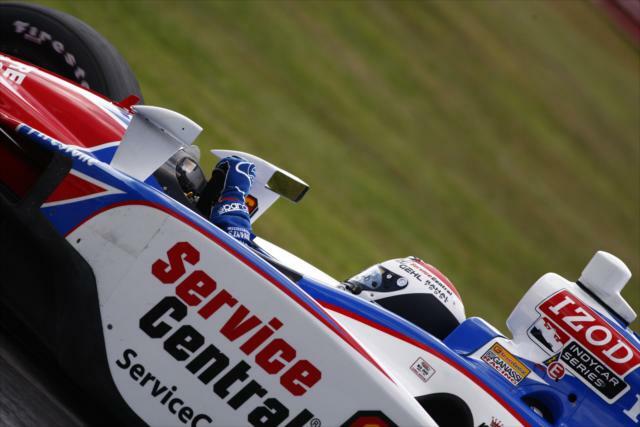 Rahal commented on the slick Mid-Ohio Sports Car Course. While Graham Rahal's road course prowess in open wheel is acknowledged, the Friday practice for the IZOD INDYCAR Series' Honda Indy 200 presented some surprises. Timing slightly slower than Rahal, the KV Racing Technology #59 car of EJ Viso was only 5/100ths of a second off the top time in the early track session. "This result is very important, it shows us that we have a fast car for the weekend and hopefully we have the control to bring a good result." cited the Venezuelan driver Viso. Another somewhat major surprise from the usual superteam dominance, Dreyer & Reinbold Racing's Justin Wilson is intent to continue a recent performance upturn. Other impressive top times posted on Friday at Mid-Ohio included a 6th fastest effort by Newman/Haas Racing rookie James Hinchcliffe, an 8th by red hot Andretti Autosport driver Ryan Hunter-Reay and an 11th fastest time posted by the #78 HVM Racing team car driven by Simona de Silvestro. Finishing first at Toronto and third on the Edmonton airport circuit, Dario Franchitti enters the Mid-Ohio Honda Indy 200 ready to seek an advantage over the IZOD INDYCAR Series rival Will Power. Franchitti was 4rd fastest in the first practice driving the #10 Target/Chip Ganassi Racing car. The Scottish defending champion Franchitti just barely edged on the #12 Penske Racing car of Power on practice time proving early an advantage might be difficult to discover. Saturday IZOD INDYCAR action at Mid-Ohio includes a one-hour practice starting at 9:30 AM with a qualifying to be held at 12:55 PM.